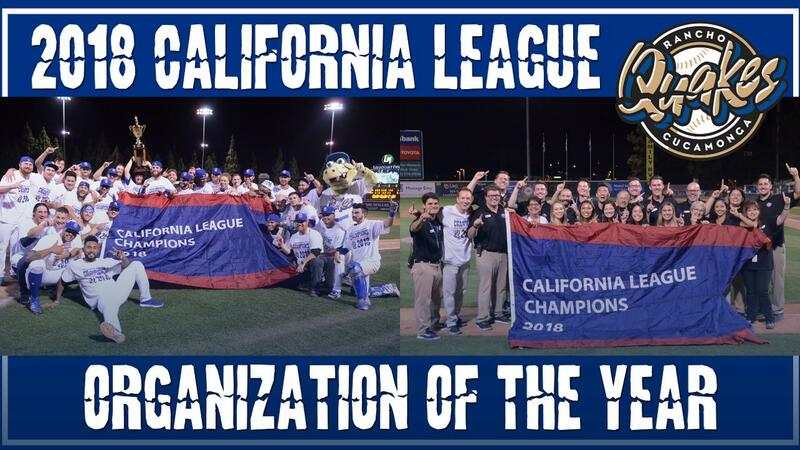 Rancho Cucamonga, CA - For the fourth time in six seasons, and second consecutive year, the Rancho Cucamonga Quakes have been voted Organization of the Year in the California League. This post-season award, voted upon by all eight California League teams, also includes the Excellence in Marketing and Promotions award. The Quakes completed the winningest season in franchise history with the 2018 California League Championship on September 14th, sweeping Visalia in a three-game series. Off the field, the Quakes celebrated their own victories with continued financial growth and community-centered partnerships. Among this year's promotional highlights, the Quakes were honored to be included in MiLB's Copa de la Diversion initiative, transforming into the 'Los Temblores de Rancho Cucamonga' for six Sundays. The initiative led to new relationships with local and national Latino-based brand, media partners, businesses and community arts groups. "To be named Organization of the Year is such an honor," Vice President/General Manager Grant Riddle said. "The unbelievable success we witnessed on the field is magnified by the fans, sponsors, city of Rancho Cucamonga and staff whom with we made terrific memories. This award is a recognition of their contribution in 2018, and the 25 years prior, to our organization." The yearly award honors a "complete" baseball franchise that has demonstrated franchise stability and significant contributions to its community, league and the baseball industry. By winning the award, the Quakes will now be the California League nomination at this year's Baseball Winter Meetings in Las Vegas, where one minor league team will be named the John H. Johnson President's Award winner, honoring the top organization in all of minor league baseball. The 2018 promo schedule included the fifth-annual Star Wars Night, as wells as the introduction of Magic and Muggles Night and Heroes (First Responders) Night, along with a sold-out Military Appreciation Night, and four youth clinics for over 1000 local children. To support select theme nights, the Quakes hosted four jersey and two hat auctions in 2018, partnering with LiveSource, a live-event auction platform, providing in-stadium fans with a more enjoyable experience and exposing the Quakes brand to auction participants nationally. Plans to celebrate the 2018 Championship for the 2019 season are underway! For information about Season Tickets, please (909) 481-5000 or visit rcquakes.com. Go Quakes!! !